The gods will keep them apart. When shy, awkward Helen Hamilton meets Lucas Delos for the first time, she thinks two things: the first, that he is the most ridiculously beautiful boy she has seen in her life; the second, that she wants to kill him with her bare hands. OK, I admit it, I have a thing for Greek mythology (if you haven't guessed yet from all those Percy Jackson books). So, of course, when I saw this book, I thought that it would be very interesting for me to read another Greek mythology book. I was excited and happy to start reading it. 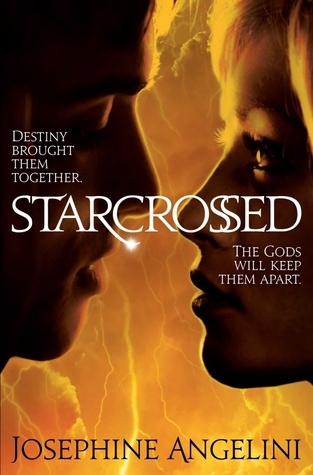 If it weren't for my book rule to always finish a book, I would have stopped reading Starcrossed before the action. Why? Well, I had several reasons... First, there was an awful lot of world building to be done, and there wasn't any action until almost 100 pages in. A lot of information was also poured into the story, so I was really confused during some parts of the book. I also found the writing style a bit childish, as if the teens like Claire tried to talk in the hippy teen language. Otherwise, once the action came and things actually happened in this book, I enjoyed reading it. The action kind of made up for the beginning of the book. There was a lot of fighting near the middle and the end of the book. There was also a giant "Oh no!" moment three quarters of the book in. A lot of questions get answered near the end of the book. The characters didn't have a lot of personality traits in the beginning, but then you can slowly see the different personalities. I also noticed, that everybody either hates Helen or loves her and lets her off the hook way too easily. Sometimes though, Helen is so thickheaded, that I wanted to scream at her in frustration for not understanding something. Claire and Hector were probably my favourite characters, Claire was kind of sassy and Hector was just a really nice guy beneath all of the tough guy act. I thought that the romance between Lucas and Helen was a bit cheesy and a bit too "instant-love" for my taste. Besides that, the book was good, there was something that kept me wanting to read more. I enjoyed it and look forward to the next book. I give it 3 out of 5 stars. Richard Titus - "The Gift of the Quoxxel"
Laura Vanderkam - "The Cortlandt Boys"
Catherine Fisher - "The Oracle"